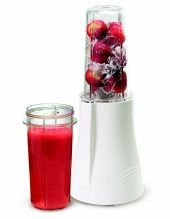 Tribest Personal Blender and Grinder model PB-250 - For grinding or blending on the road or at home! Health food made easy. 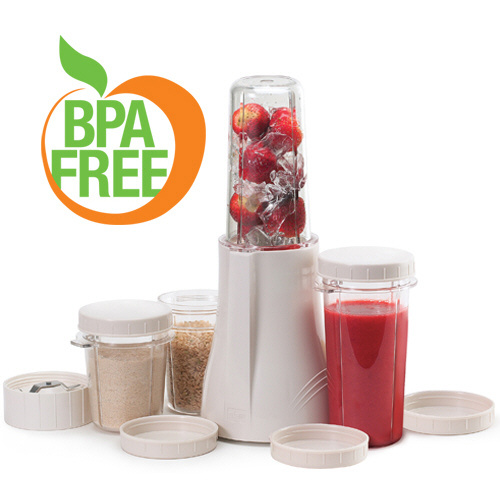 Grinder pulverizes nuts, seeds, coffee beans or even flax seeds into flour/powder in a snap. Quickly and easily turns whole, fresh foods into smooth-swallowing, no-chewing necessary foods for babies. We love the Personal Blender. We have used it when traveling to make smoothies and salad dressings. With the convenient lids, we made a fresh, raw salad dressing and "put a lid on it". We then took it into the restaurant and poured it over our salad while remaining inconspicuous. We also use the Personal Blender to to grind flax seeds and into powder. When used as a grinder, you can make a powder/flour out of nuts or seeds. You can even grind fresh beans for your morning coffee! 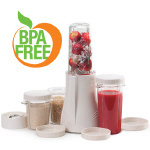 Includes: Motor Base, 2 blending containers, 2 grinding containers, 2 Blending container lids, 2 grinding container lids, 1 two prong grinding blade, 1 four prong blending blade and instruction/recipe booklet. In the picture above, see the configuration of the grinding blade on the left, and the blending blade on the right. Both blades are included with the PB-250 model.